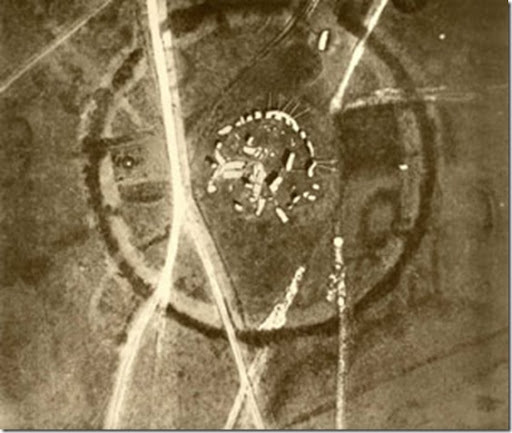 The first aerial photograph of an archaeological site, Stonehenge in 1906 taken from a balloon by Lt. P. H. Sharpe. Aerial photography, the practice of taking photographs of the ground from an elevated position has been in use since the 1850’s. At this time balloons were used to lift the photographer into the air from where the photographs could be taken. The first photograph taken of an archaeological site was of Stonehenge in 1906, taken from a balloon. It was during the First World War with the rise of the airplane, when the value of aerial photography came to prominence, as it was recognised as an invaluable means by which to map the opposing sides trenches and positions. The same was true for the Second World War when reconnaisance flights were conducted by both the allied and axis forces and the photographs used in the planning of invasions, bombing and other military campaigns. In the years after the Second World War these photographs and others taken by archaeologists and civilians alike were used to map and interpret the landscapes past as they offered a detailed perspective of the landscape, revealed earthworks not visible at ground level or displayed sites which had been lost through agriculture, construction or military actions. 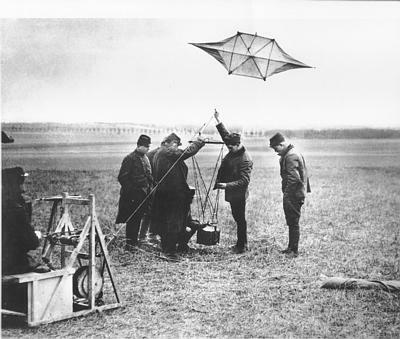 Since the late 1800′s, kites have been employed as a means to lift cameras into the air and photograph the landscape below and kites as well as planes were used as a means to photograph enemy positions during the First World War. It offers a cost-effective means of photographing the landscape and specific targeted sites in great detail. While it does have it’s disadvantages (e.g. weather reliant, tree cover, power cables), there is little cost and time involved in getting the camera airborne so it can be used almost at any time, weather dependent and does not suffer the same restraints as commissioning a plane flight or using a UAV. This project makes use of this system in order to better understand the layout of the many sites across the projects study area and was supplied in full by Dr. John Wells of the West Lothian Archaeological Trust in Scotland (http://westlothianarchaeology.org.uk/). As part of this, John donated a complete kit to me to assist in my ongoing research. This includes a HQ Delta kite, line, Pentax camera and picavet rig to attach the camera to the kite line. For this I am eternally grateful!!! The system operates by releasing the kite and flying it for a few minutes to make sure their are no faults in the kite or line, determine wind movements and to ensure there is continuous lift. The camera sits in a cradle which is attached to the picavet rig. The picavet system, named after Pierre Picavet is a cross which is then attached to the kite line at two points using a single length of string which is threaded through rings on the four cross points and through the two clips on the kite line. The The weight of the camera and the cradle pulling down on the line causes the string to run through the loops and allows the camera to level off as the kite rises and falls on the air currents. The rig allows the angle of the camera to be set so vertical and oblique photographs are an option. The shutter is operated by setting the camera to take a photo every ten seconds. After this it is released and photographs can be taken. The website of the West Lothian Archaeological Trust is an excellent source on the history, operation and use of kite aerial photography and is well worth a visit. An alternative means for obtaining those aerial photographs to try out….